In Run-Command the Control-Panel menu is not correctly displayed, when your use the wrong version of Run-Command ! 1.) ... What should be noted in the system control menu! 2.) ... Activate the Control Panel menu in the Run dialog! See also: ► Create a new Favorite or Command! 1.) What should be noted in the system control menu! ► ... Is my Windows-7 x64, or x32? ► ... have I x64 Edition or Windows x32/x86 on Windows 8/8.1? (Image-1) Correctly Control-Panel-Menu in Run-Command! 2.) Activate the Control Panel menu in the Run dialog! 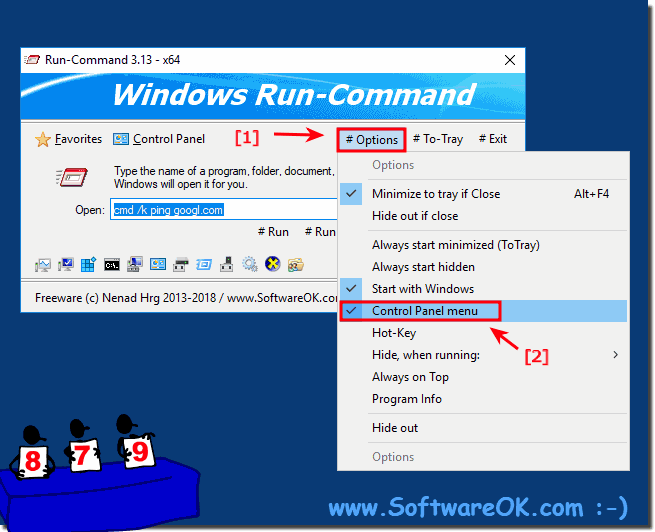 (Image-2) Activate control panel in Run-Dialog for Windows! Run-Command - FAQ-1: In run-command is the control panel not correctly displayed!